This is a fragile forktail, the first I’ve seen for the year. They’ve been the first damselfly species I see in North Carolina each spring since I moved here, though they’re my second species this year. El Nino at work most likely! It’s easy to tell fragile forktails from other species. See the exclamation point marking on the sides of the thorax? That’s a good indication that you’re looking at a fragile forktail. The males and females look very different too, so it’s very easy to tell them apart at a quick glance. The males look like the one above, bright lime green and black, while the females are blue with black markings. Damselflies can be hard to identify because so many look so similar, so it’s nice to come across the easy ones in the field! Thanks for the info, I love this photo, great lines. Thank YOU – and you’re very welcome. Glad you likes it! Wow, so now I can ID 2 species of damselflies! Thanks for the fragile forktail! Excellent! This is a nice, easy one, so I am glad I could give you another one. Today’s topic was too easy for you. :) It’s great to see the odonates starting to appear. Bring them on! Have you seen any in your area yet? I saw someone reporting green darners in Maryland on one of the odonate listservs today! I’m going out today and see what I can find. 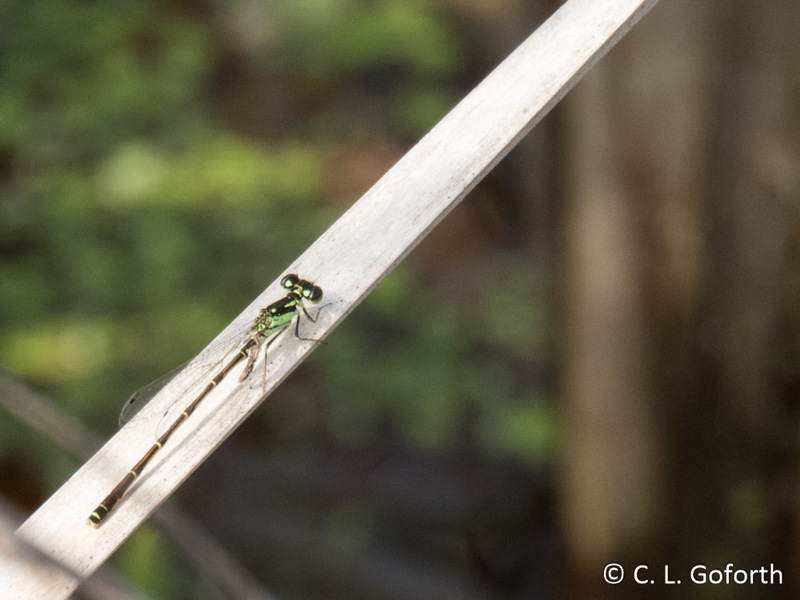 Someone spotted a couple of Green Darners at my local park earlier this week, but nobody has gotten any photos yet as far as I know. Nice! Hope you are able to find some! I’m glad you agree! I love these little guys.